We currently lead monthly support group meetings for head & neck cancer survivors, patients and their families. The meetings are co-facilitated by head & neck cancer survivors and oncology physicians. The treatment of head & neck cancer, particularly radiation, is among the most grueling of all cancer treatments. By building a network of patients and survivors who are willing to share their experiences, we are able to build a pathway of invaluable insights and information sharing to help patients who have recently been diagnosed or are in the treatment phase. We will be offering individual consultation for those who prefer a more private setting and also plan to create an information repository including Q&A and the ability to submit specific questions through our website. Because of the debilitating nature of head & neck radiation, it can be very challenging for families to keep up with everyday items including the very act of getting to and from treatment. Time and energy should be spent battling this awful disease and trying to maintain some level of strength instead of worrying about which household chores need to be completed. One of the most important issues throughout treatment is the ability to maintain nutritional sustenance. With that in mind, we provide access to an oncology specific nutritionist. We also provide families with a magic bullet blender and protein powder as a nutritional starting point. Head & Neck cancer patients rely heavily on a number of medications to manage pain, reduce side effects and to battle mucositis which is critical to maintaining nutrition and hydration. These medications can be very costly and many aren’t covered by insurance. 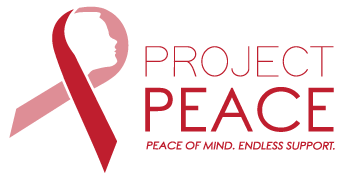 Project Peace is committed to ensuring that no patient goes without critical medication because they can’t afford it. We also help with everyday household needs such as transportation, gas cards, meals, grocery shopping, house cleaning, and lawn services. For those who have a network of available support but may lack coordination, we can create and maintain meal schedules.